I’ve had more of these carrot apple muffins than I should probably admit today and I’m not mad about it. Sometimes you just need to sit down with a hot cup of coffee and a really bomb muffin, ya know? And just look at those insides! So soft! So tasty! Not to mention so ready to be in and around your face! I’ve got an ongoing list of recipes that I’d like make/share here on the blog…and when I say ‘list’ I mean that I haphazardly scribble down any recipe I think of on whatever nearby notebook or scrap of paper I’ve got within reach. I’m sure you can imagine the sheer amount of scraps I’ve accumulated over time. I’ve really got to come up with a better system. A lot of recipes come and go. As much as I’d like to make everything, sometimes I just don’t have the time or the will to get to everything. 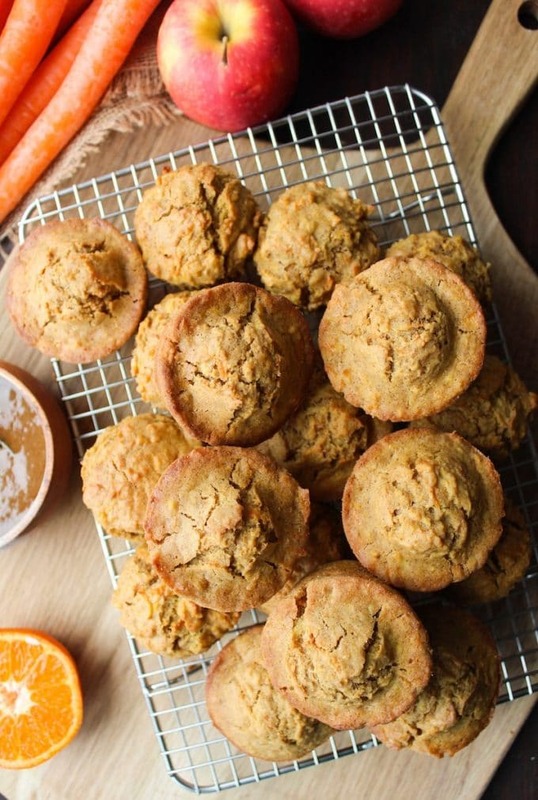 One thing that has been on my list has been these carrot apple muffins. Well, not these muffins. It’s taken a few recipe evolutions before I finally landed on this particular recipe. 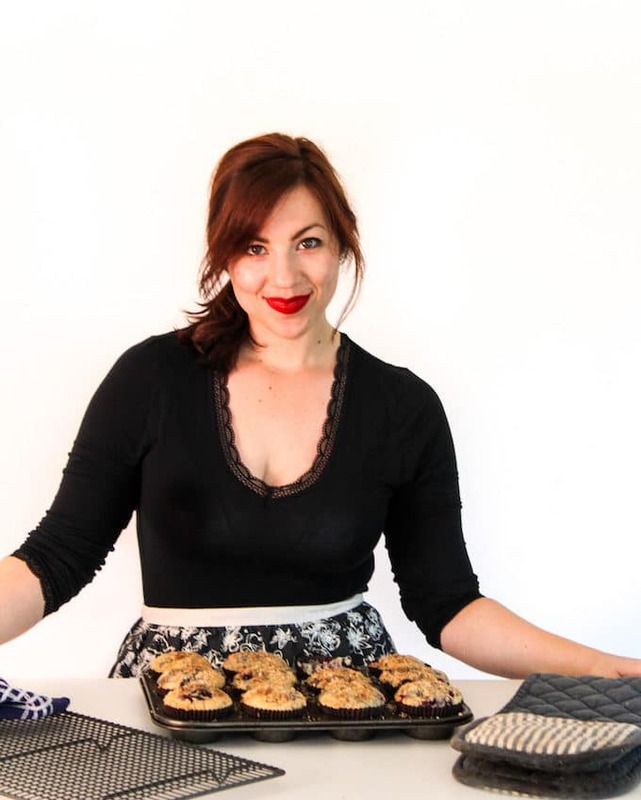 Originally I wanted to share a paleo carrot cake type muffin, but then I remembered that I actually already have a paleo carrot cake that I shared last year. Not a muffin, but still close. I played with the idea of making a nut based carrot muffin instead but shut down that idea fairly quickly after a trip to Costco yesterday. Mike & I were stocking up on essentials when I noticed that a 3 pound bag of almonds cost £17 then proceeded to nope my way down the aisle. Almonds have never been cheap but they’ve gone way up in price since the last time I bought a bag. 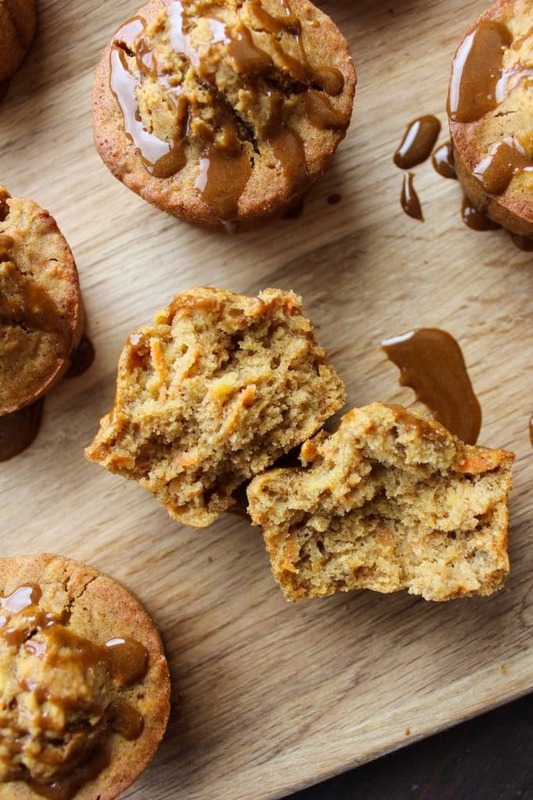 So instead of making a paleo version of these carrot apple muffins with potentially inaccessible flours I decided to make these healthy-ish muffins instead. I really struggle to claim anything is ‘healthy’ because I truly believe that it looks different for everyone, though I do think these are a great healthier option since they’re made sans gluten, dairy, refined sugars and less oil than you’d normally see in a muffin. To lighten up on the oil I decided to add in some grated carrot which works double time as a sweetener too. Any variety of apple will do – I used pink lady but use whatever you’ve got on hand. This recipe calls for 1/2 cup grated apple which was 1 medium sized apple for me. This also calls for maple syrup as an added sweetener but you can swap that out for honey if you like. 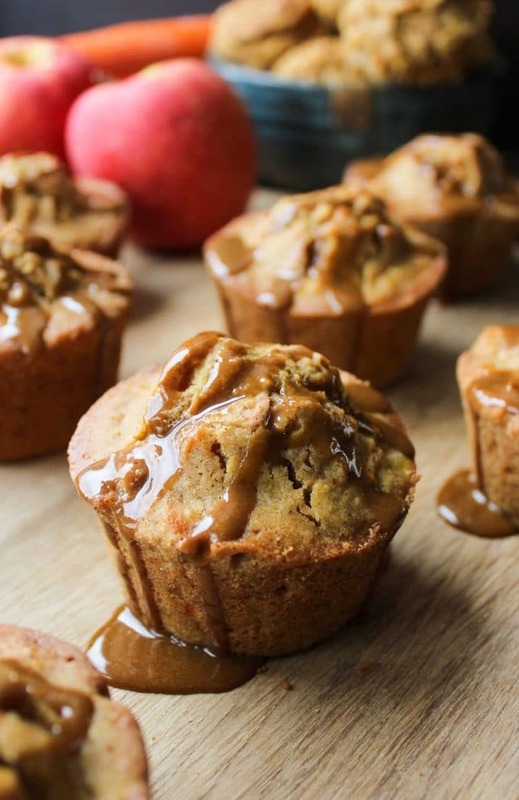 I originally tested these with half the amount of maple but those muffins came out pretty ‘meh’ so I wouldn’t recommend reducing the sweetness here. As for the glaze it’s completely optional. Glazes on muffins just seem necessary to me. In order to keep this refined sugar free Mike gave me the idea to make powdered coconut sugar with our blender and now I’m pretty sure I’m going to be making coconut sugar glazes for days. All in all this recipe is pretty simple and made in one bowl. Score. 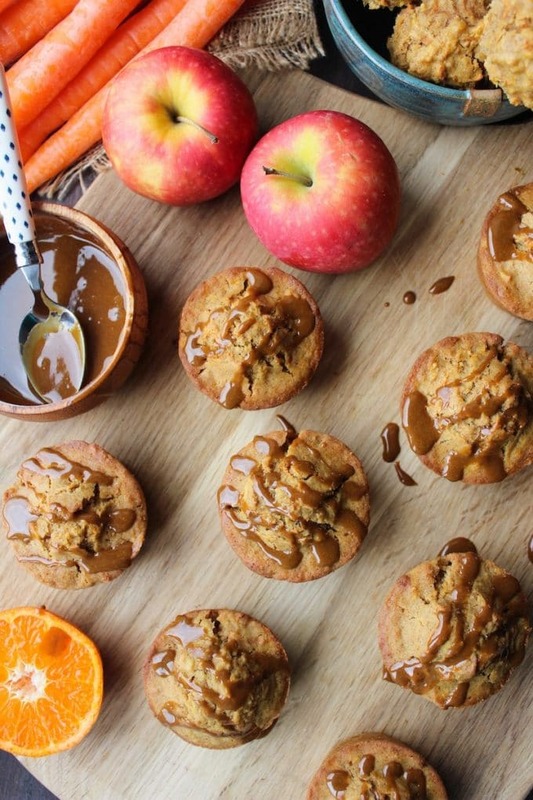 Don’t forget to #asaucykitchen on instagram if you try these carrot apple muffins! I love seeing what you make with! You can also post your pictures to our facebook page! Preheat the oven to 425°F/220°C. Grease a 12 cup muffin tin or line with silicon cupcake moulds. Since these muffins are lower in oil they'll stick more to paper liners. In a large mixing bowl whisk together the eggs, vanilla, maple, sugar and coconut oil until combined. Add the flour, flax, baking soda, cinnamon and ginger to the egg mixture and stir well until fully combined and evenly mixed. Add the carrot and apple and stir a couple more times to combine. Divide the batter between 9 muffin cups filling all the way to the top. Bake the muffins at 425°F/220°C for 5 minutes, then keeping them in the oven without opening the door, reduce the temperature down to 350°F/180°C and bake for another 15-18 minutes or until knife inserted into the centre of one comes out clean. Allow the muffins to cool for 10 minutes in their tray before transferring them to a wire a rack to cool longer. Add the coconut sugar to a high powdered blender (I used Blendtec) and process until you get a soft powdery sugar. You can also just use regular powdered sugar here instead. Add the sugar to a small bowl and add the orange juice. Whisk together with a fork until no lumps remain. Once the muffins have cooled drizzle the glaze over the tops and enjoy. I just made these. Didn’t have coconut oil so just used regular virgin oil. Also threw in 1/3 cup of raisins. they are yummy. Just had one without frosting. But feel Im going to add frosting to the rest. Thank you for this post. Yay! So glad you liked them! Thanks Stephanie! Hi. Id like to make these for my sins first birthday. Can they be frozen if I make ahead? Hi Heidi! Happy Birthday to your little one! I have’t tried freezing these yet but I do think that would work just fine – I’ve frozen similar type of muffins easily. Usually you can just reheat it in the microwave from frozen in about 30 seconds to a minute. Hope you like them! I’m in need of dairy and gluten free options for a party this weekend…these look perfect! I just wondered whether I could leave out the flaxseed or whether you think that would affect the outcome? Thanks! Hi Hannah! I haven’t made this without the flax yet so I can’t say for sure but I’m also positive that you can just replace the flax with more flour and you’ll be alright. Hi, could I substitute the coconut oil for another type of oil or non dairy spread? Got to avoid dairy, gluten and nuts 🙄 and these look yummy! Hi Michelle! I haven’t tried it with other oils yet, but usually with coconut oil you can swap it out 1:1 for another type of oil. Pretty much any oil would do!